As part of the annual Myseum of Toronto’s Intersections Festival, the Clara Thomas Archives and Special Collections (CTASC) of York University Libraries and its community partners invite you to a film night, an interactive exhibition, and a walking tour to explore the city’s cultural and historical diversity. These three event share York University research and archival material with the community at large thanks to the work of York archivists Anna St. Onge and Katrina Cohen-Palacios, York History professor Sakis Gekas (GCHP), York History PhD graduates Jay Young (Archives of Ontario) and Christopher Grafos (GCHP), York AMPD Masters graduate Ananya Ohri (Regent Park Film Festival), and York History PhD Candidate Michael Akladios (CCHP). On Thursday, March 8, from 6pm to 7:30pm at the Palmerston Toronto Public Library Theatre, Motion Pictures: Immigration Films from the Vaults of Toronto’s Archives will demonstrate the role of moving images within the creation and dissemination of stories of immigration, and the integral role of Toronto-area archives in the preservation of such films. At the event, the Regent Park Film Festival (RPFF) will present their innovative project Home Made Visible which aims to address an important gap in the preservation and celebration of the home movie footage of Indigenous and Visible Minority Canadians. CTASC is the RPFF’s archival partner in this project. #MyseumX talks, tours & exhibits kick off March 12 at St Mark’s Coptic Museum with @theCCHP @myseumTO! Save the dates! From March 12 to 24, St Mark’s Coptic Museum and the Coptic Canadian History Project (CCHP) will present the Journeys of the Copts and their Artifacts, showcasing the culture, immigration, and achievements of Egypt’s Coptic Christian diaspora in Toronto and Canada through three initiatives in public programming. A multimedia talk on March 12, 22 (6:30pm) and 24 (3pm) will explore the topic of “St. Mark’s Parish: Copts’ Journey Through Toronto’s Places of Worship, 1962-1978.” Secondly, a new exhibition will share the museum’s history and milestones alongside the stories, challenges, and achievements of 33 Coptic professionals. While displaying the museum’s first artefacts and memorabilia, the museum will also launch a historic series of contemporary narrative icons by iconographer Victor Asaad Fakhoury, which masterfully chronicle events that have affected the Coptic Church and Copts in Egypt since the so-called “Arab Spring” in 2011. RSVP to take the free shuttle bus to the event. York University Libraries, Clara Thomas Archives and Special Collections, Toronto Telegram fonds, ASC03483. 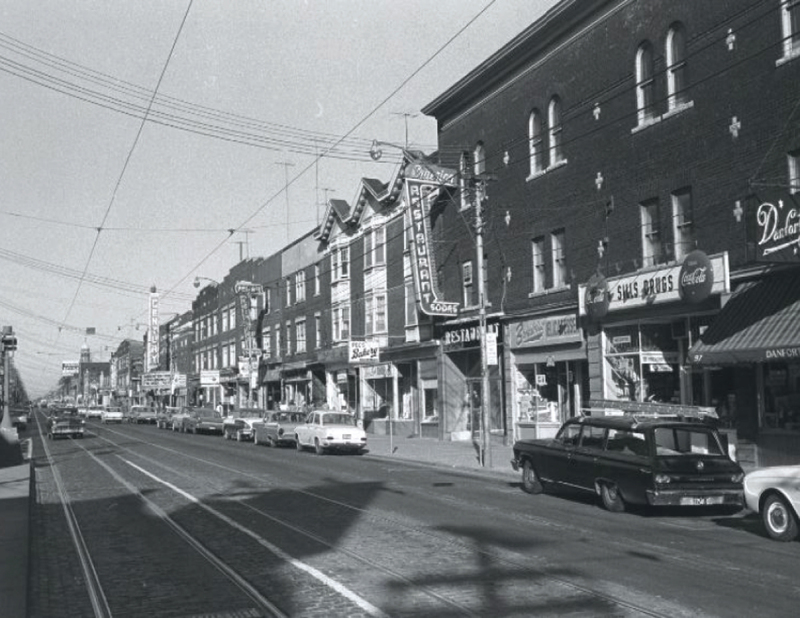 On March 24 and 25 at 10:30am and 2:30pm, Gateway to Greektown: A Historical Walking Tour of the Danforth will be led by the Greek Canadian History Project (GCHP) to illuminate Greek immigrant life and the history of Greektown in previously unexplored ways. The event will take participants to important historical sites that currently escape our collective memory. RSVP to attend the walking tour. I’m touched by this project. However, I believe that Greektown on the Danforth is in danger of becoming a thing of the past with the only remnants being the 2 statues on Logan. Greek businesses have mostly shut down or packed up and gone to Scarborough. Apart from a few restaurants and bakeries there are no other Greek businesses on the Danforth. I can’t help but wonder if it is because we Greek immigrants are ashamed of being labelled “Danforth Greeks” like its something to be avoided. Neighborhoods off the Danforth, particularly around Withrow Park were once teaming with Greek immigrant families, a close knit community. But they quickly decided they should “move on up” to a better neighborhood in Scarborough, Mississauga, etc. No one ever shops at the Danforth any more and Greek is now becoming a language that is no longer heard on the Danforth. You use to be able to walk into any establishment and speak Greek. You use to be able to order a meal in Greek. You use to be proud of being a Danforth Greek. Hell, even the historic plaque in front of the Danforth Music Hall has left out the fact that in the 70s and 80s it was called Titania Theatre and a place of gathering for many Greek families on Sundays, watching movies from Greek Cinema’s Golden Age and shedding a tear for the home they had left behind.